In this article, we explain why unfair high stakes tests – which are now required in order to get a high school diploma here in Washington state – will severely harm more than 180,000 students during the next four years. Currently more than 10,000 students per year are denied a diploma due to failure to pass a high stakes test. However, unless state law is revised, by the class of 2019, the number of students denied a diploma due to failure to pass a high stakes test will explode to more than 40,000 students per year! 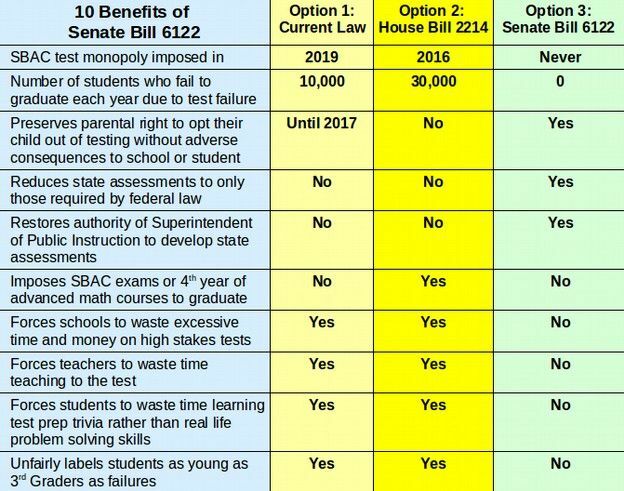 Our hope is that after reading this article, you will work to help us pass Senate Bill 6122, sponsored by Senators McAuliffe, Chase and 9 other Senators which would eliminate high stakes testing as a graduation requirement here in Washington state. In the past year, both the Washington State Democratic Party and Washington State Republican Party have passed resolutions by overwhelming majorities opposing Common Core and its associatedhigh stakes high failure rate SBAC test. Tens of thousands of teachers have staged walkouts in more than 60 school districts across Washington state to protest these unfair tests. 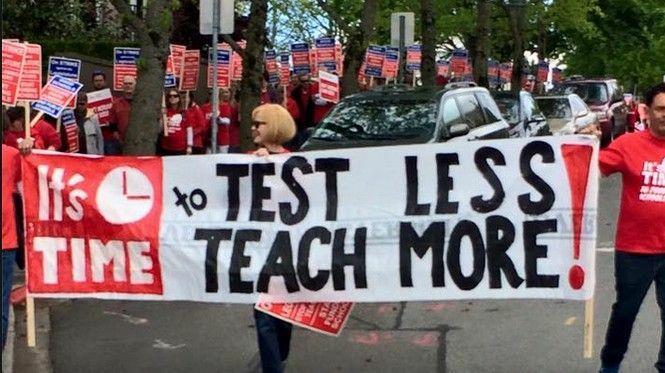 In addition, more than 60,000 parents and their children opted out of the SBAC tests in 2015 – including about 40,000 of our state's 80,000 11th grade students - by far the largest high stakes testing protest ever in the State of Washington. The teachers, parents and students of Washington state have sent a clear message to legislators in Olympia: It is time to end the unfair, invalid and unreliable SBAC test! Why Are So Many Parents Teachers and Students Opposed to the SBAC Test? Yet studies done in several states have confirmed that there is no relationship between the scores on high school tests (such as the SAT or any other high stakes test) and college completion. For example, a 2007 study of more than 81,000 high school students in California found no relationship between their scores on the SAT test and completion of college four years later. Many students who did poorly on the high stakes test completed college while many students who did well on the SAT test did not complete college. 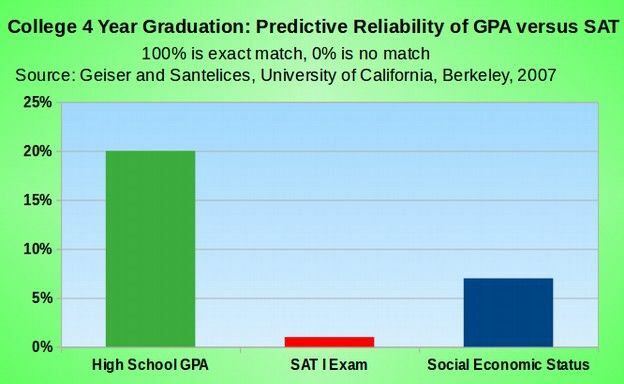 The only factor that predicted college graduation was a student's cumulative high school grade point average (GPA). In other words, how students did in their actual classes matters more than how they scored on a high stakes test. 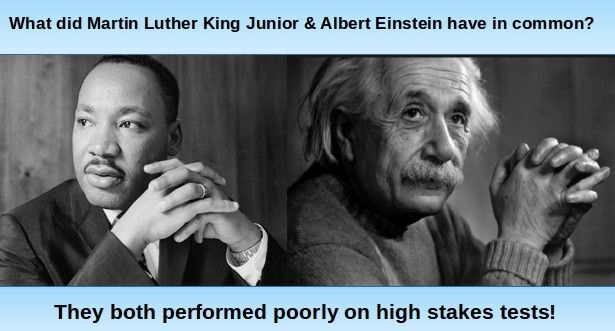 Put in plain English, high stakes tests are an utter waste of time and money. But high stakes tests like the SBAC are worse than worthless – because they inflict severe harm on our students. In particular, organizing education around high stakes high failure rate tests “as a graduation requirement” increases the drop out rate and increase the number of low income young adults who wind up in committing major crimes and going to prison – destroying lives and costing tax payers hundreds of millions of dollars in added prison costs. The increase in the drop out rate due to the introduction of high stakes tests is about 10%. In other words, if the normal graduation rate is 80%, forcing high stakes tests as a graduation requirement lowers the graduation rate to about 70%. Organizing education around high stakes high failure rate tests severely harms the lives of about 10% of our high school students. These students are almost entirely from low income families – end up unable to get a good job or attend a good college due to failure to pass a high stakes test. 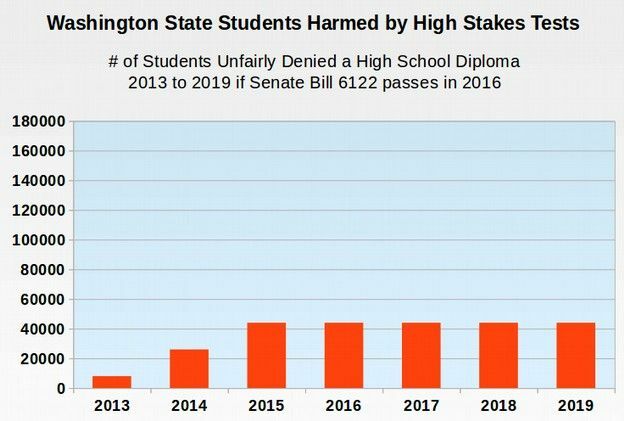 Since there are about 80,000 students in each grade here in Washington state, ten percent is about 8,000 high school students per year whose lives are harmed by forcing them to take and pass high stakes high failure rate tests in order to graduate from high school. 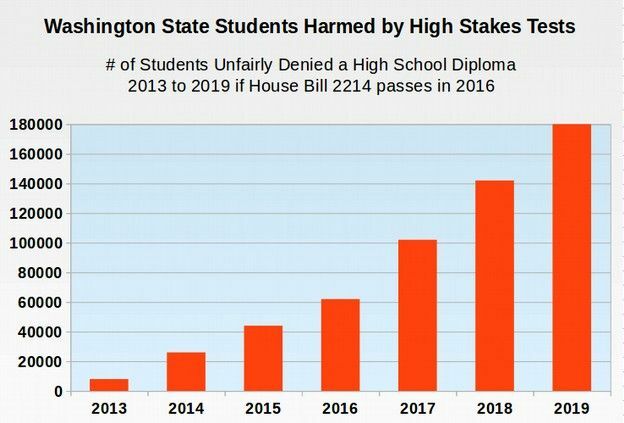 Despite the massive amount of research confirming that high stakes tests harm rather than help students and are only good for increasing corporate profits, the Washington state legislature in recent years has ignored this research and repeatedly required passing one or more high stakes tests as a graduation requirement – in addition to all of the other graduation requirements imposed on students in our state. 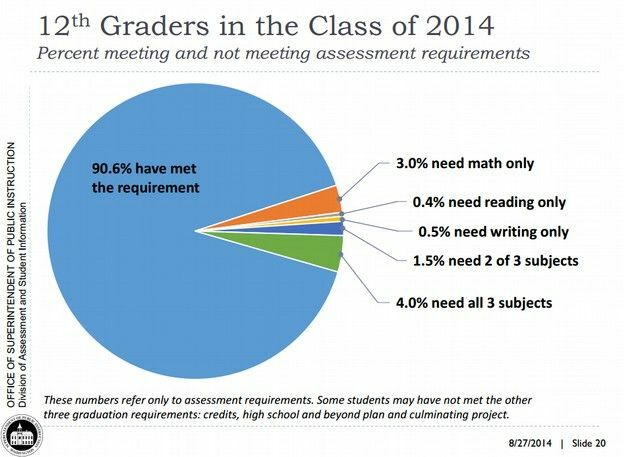 While high stakes math tests have been given to high school students in Washington state since 1999, and have been threatened to become a graduation requirement since 2007, they have only been an actual graduation requirement for the graduating classes of 2013, 2014 and 2015. In December 2006, Governor Gregoire signed an order delaying the math WASL graduation requirement until 2008. Then in 2007, the Washington State legislature passed Senate Bill 6023, sponsored by Senator McAuliffe, delaying the math WASL requirement to 2013. In 2008, the voters got fed up with the awful WASL test and replaced the former pro-WASL Superintendent of Public Instruction, Terry Berguson, with a new Superintendent, Randy Dorn who pledged to eliminate the WASL and replace it with a much shorter, fairer and less expensive test. Unfortunately, instead of a shorter, fairer and less expensive test, Randy Dorn created a longer, more expensive and less fair test called the Common Core SBAC math test. 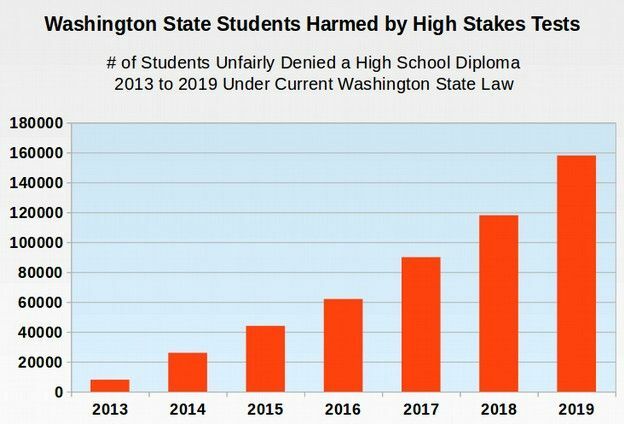 Thousands of Students in Washington State Have Already Been Harmed! 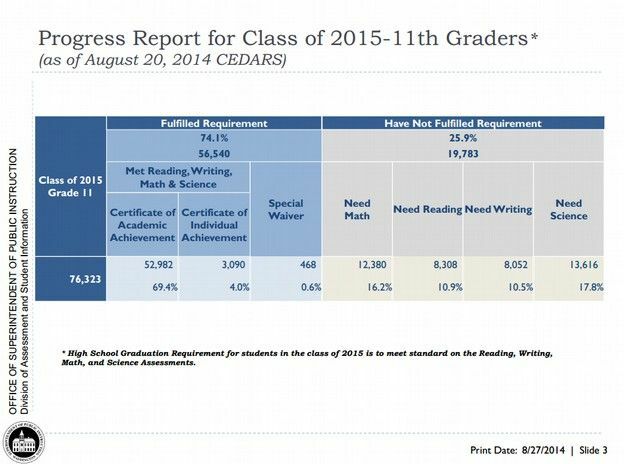 According to an August 2014 OSPI Press Release, just under 90% of all students in the Class of 2015 had passed their reading and writing test requirement but only 84% had passed their math requirement and only 82% have passed their biology requirement. Only 75% had meet all four test requirements. Put in plain English, if the biology assessment placed a roadblock in front of 11,000 students, then the math assessment blocked 10,000 students and the reading and writing exams each blocked 5,000 students. In total, the exam requirement blocked about 15,000 students. Here is what the breakdown was for the graduating class of 2014 (with 2015 and 2016 did not need to pass the Biology End of Course exam). 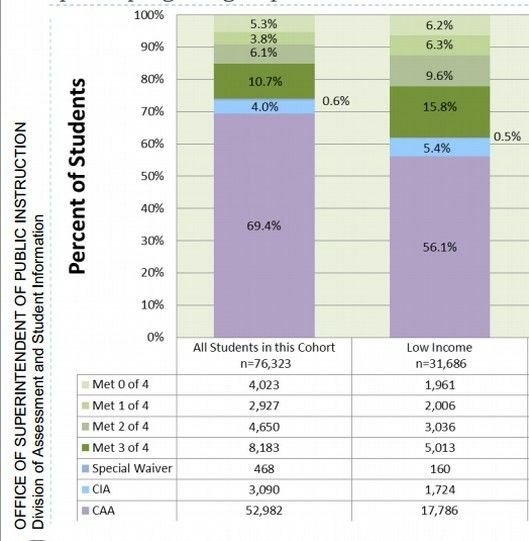 The above chart shows that about 10% of students in Washington state were not able to graduate in 2014 due to failure to pass a high stakes test and then failure to complete the Collection of Evidence process. This means that in 2014, there were about 8,000 students who did not graduate due to these tests. Most of these students were blocked by failing two or more tests. Adding the Biology COE/EOC failures to this process will likely lead to this number increasing by the same amount who are blocked on the Math EOC/COE. This will raise the total by about 2,000 to 10,000 students (except that the Biology exam was waived for the Class of 2015 and 2016 in July 2015). These are all of the students who had failed their State exams and were dumped into the four Collection of Evidence Processes. The above table makes it clear that the problem with math and reading and writing failures for the Class of 2015 is nearly as great as the problem with Biology exam failure. So were is the love for the Math and English failures? Why were all of the speeches in the State legislature focused on the Biology exam problem when the English and Math exam problems were blocking nearly as many students from graduating? 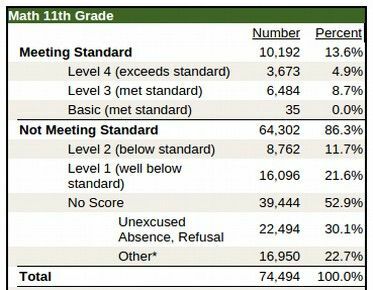 The above table, issued in August 2014, indicates that about 53,000 students in the Class of 2015 had passed all four state test requirements before their senior year. Another 3500 were special needs and other waiver students that will receive a special graduation certificate. This leaves about 20,000 mostly low income students who were missing one of more test requirements to graduate. Of these 20,000 students, only 8,000 needed to pass just one of the Collection of Evidence processes. Most of these 20,000 at risk students from the Class of 2015 were being blocked by failing more than one high stakes exam. 4,000 students had failed all four tests and needed to pass all four Collection of Evidence courses/processes. 3,000 more students had only passed one of the four state exams and needed to pass three Collection of Evidence processes. Just under 5,000 more students had passed two state tests and needed to pass two Collection of Evidence processes. So waiving the Biology End of Course exam did not likely to help very many more students graduate. At most, it helped about 1,000 to 2,000 additional students graduate – leaving behind about 8,000 students who had failed other state tests (3,000 students who failed the math test and 5,000 students who failed multiple tests. In addition, there are over 10,000 GED candidates per year who are failing to graduate because of the new Pearson GED test. For example, in 2013, before the Pearson GED test takeover, about 13,000 students earned their GED certificate. In 2014, only 2,850 earned their GED certificate. Because the Washington state legislature refused to address this problem, another 10,000 students will be unfairly denied a GED certificate in 2015. 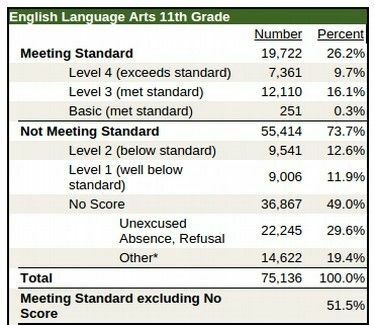 While current End of Course exams fail about 20% of students, the new SBAC English exams fail about 50% of all students. 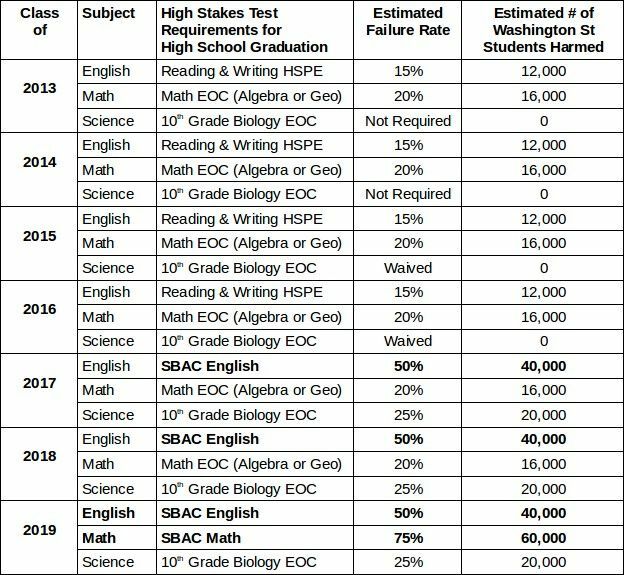 Including the 50% of 11th grade students who opted out of the SBAC test, the percentage of students in the Class of 2016 who met the English test standard was only 26%. The percent of students who met the Math test standard was only 14%. The SBAC Math test is unlike any test that any of us have ever seen. It is so difficult to pass that only 10,000 of our state's 80,000 high school juniors passed it. The SBAC Math test is so difficult, it is unlikely that more than a few members of the state legislature could pass this test. Despite the fact that few students or legislators can pass the SBAC test, during the 2015 legislative session, leaders of the Washington State House of Representatives repeatedly attempted to pass House Bill 2214 – a draconian bill that would have accelerated the adoption of the SBAC Common Core test as a Graduation Requirement from the Class of 2019 to the Class of 2016. In 2017, the Biology EOC exam will be added back as a graduation requirement. This will increase the number of students harmed by about 2,000. In addition, the SBAC English test fails about twice as many students as the Reading and Writing HSPE test. This will harm another 8,000 students. But the real train wreck will occur with the Class of 2019 when the insane SBAC math test becomes a graduation requirement. This test will fail about 70% of all Juniors – or more than 56,000 students. If House Bill 2214 (or something like it) is adopted, these struggling low income students will be required to take a 4th Year of Advanced Math. Assuming that only half of these students are able to pass their advanced math course, this will increase the number of students harmed just be the math test to 27,000. 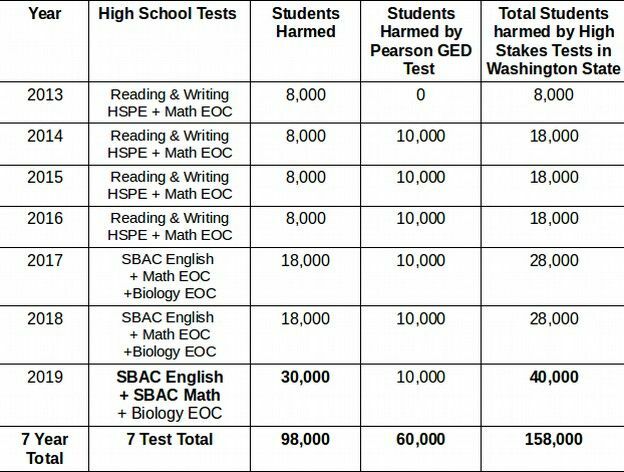 Add the SBAC English and Science tests and the number harmed will exceed 30,000. As the above tables indicate, 44,000 students in Washington state have already been harmed from 2013 through 2015 due to the high stakes testing insanity. By the year 2020, this number will skyrocket to 158,000 students harmed by being forced to pass an unfair high failure rate high stakes test just to get a high school diploma. Keep in mind that there is no benefit to any of these tests other that creating billions in corporate profits. Hopefully members of the House and Senate will finally wake up, realize the extreme harm that high stakes tests unfairly inflict on our students and pass Senate Bill 6122. There is no other solution that really addresses the problems of unfair high stakes high failure rate tests. As always, we welcome your questions and comments.